You are going to love these darling Mother’s Day coloring pages! They make the perfect present for Mom. Mom will love finding out how old she is and what she keeps in her purse (hehe). More than anything, though, she will love the time and thought her little ones put into a keepsake just for her. Here’s one my daughter colored for me. I was surprised she knew my age. And I loved how she filled in the blank for what I always say: “I love you no ‘mader’ what.” It’s true! 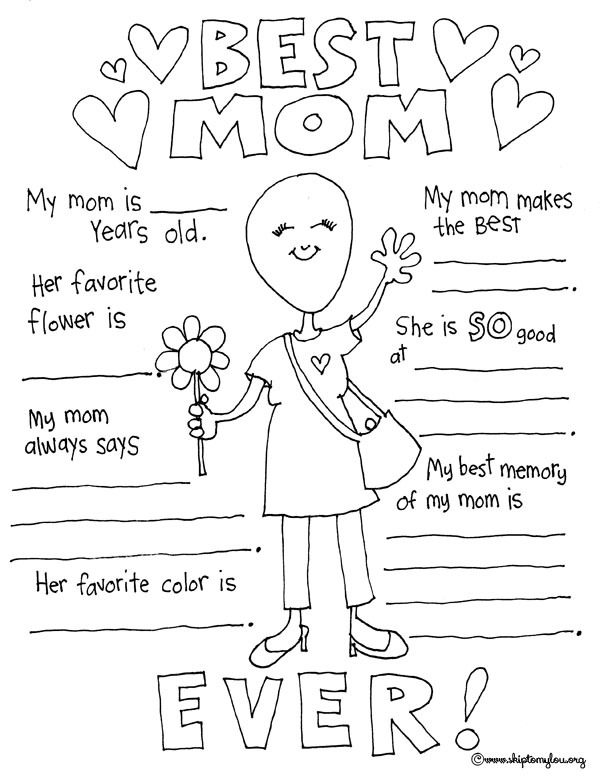 Below are two fun styles of Mother’s Day-themed coloring sheets. 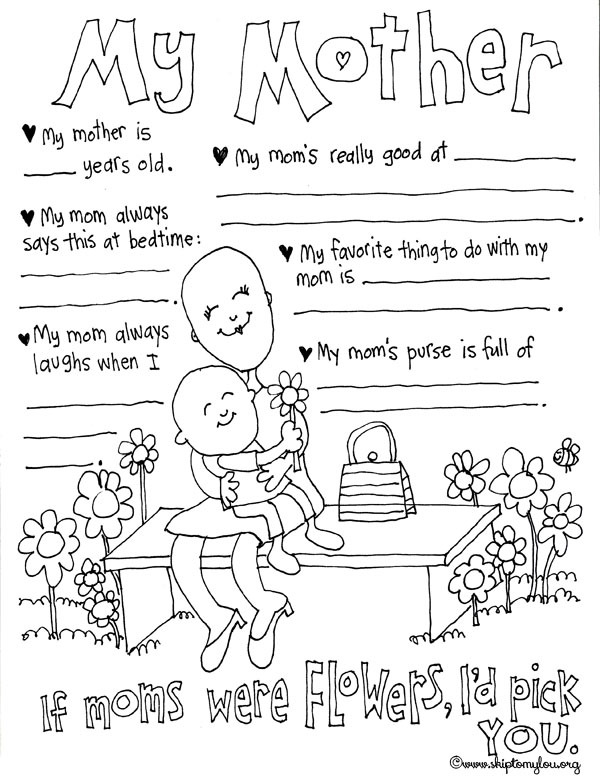 Just download, print, color and give to a special mom. This is more than just a coloring page—some teachers might call them graphic organizers. They make wonderful activities for elementary school classrooms in the week before Mother’s Day. But whatever you call these activity sheets, kids will have fun coloring and filling in the blanks, and moms will love receiving them. If your kids love coloring, check out all my other free coloring pages. With all the art your kids will be making, your fridge doors may never see the light of day again. How about this Mother’s Day coloring sheet? I especially enjoy seeing how my kids answer the open-ended questions. So fun to learn your child’s thoughts. Have children color these pages every year for a wonderful keepsake that will record how much the child (and mom) have changed. Print the coloring page on regular copy paper, or cardstock if you want it to be more like a Mother’s Day card. Then hand it off to your little artist. Coloring comes out great with crayon, colored pencil, or marker. We didn’t forget dad! He is pretty special too, and we have a Father’s Day Coloring Page for him. Are you are looking for more ways to celebrate mom? You might like this free printable coupon book for mom. If your mom likes scarves, make this beautiful handmade scarf from vintage hankies. This handprint flower magnet couldn’t be any cuter for a little one to make. And this DIY Magnetic Pin Holder is a beautiful and useful gift for a mom who sews! The best part is that any of these gifts can be made in no time at all! Finally, wrap up your Mothers Day gifts with these free Mother’s Day Gift Tags and Mother’s Day Labels. These little details will make all your gifts extra pretty! It wished Flickr to work seamlessly with Yahoo Mail. I printed them so my grandchildren could colour them for they're mum. You are a treasure ! Thank you so much. I love these! Could you please do one for 'My Teacher'? I'd love to add it to their end of the year gift. Thank you!! These are adorable! I needed to find a cute thing for 5 year olds to do for mother’s day and these are perfect to put along with a craft. Thanks!! Thank you so very much!!!! You are awesome!!! I really love this drawing and the students enjoyed writing about their Mom and they even drew hair on her head. FUNNY! Thank You ! page and your creative ideas. Thank you so much. Thanks! You saved me this morning, so cute!! Needed something cute for my class of second graders to do for Mother's Day. This hit the spot. Thanks for your generosity! Hope you have a wonderful Mother's Day as well. Thank you for this project! I plan to use it with my students. I am a grandmother ( as you can tell by my name) and usually have enough clever ideas of my own for the kids to do. But this year I have commitments up until the day I leave to be with them. A Birthday party for the eight year old the day before Mother's day. I'm good on that one but Mom's day almost got slighted. Then your page popped up. What a life saver! I've already printed everything off. 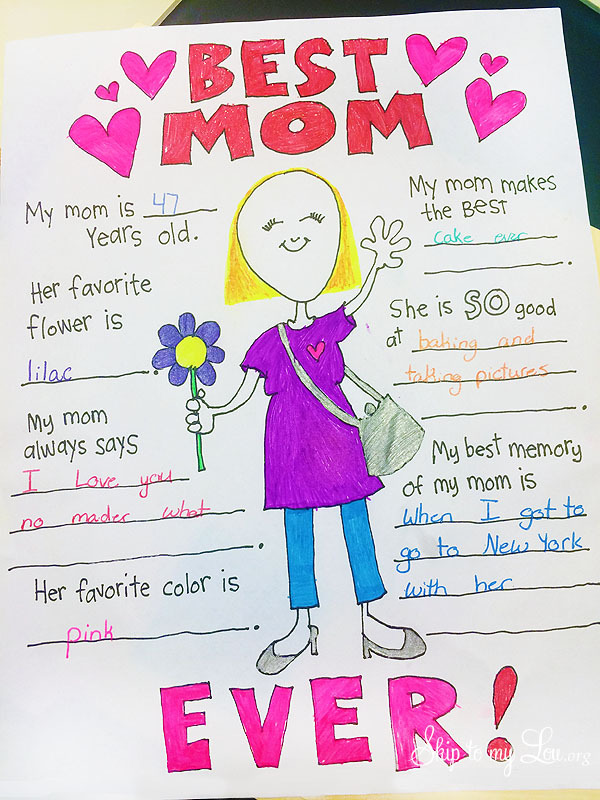 Surely we can find a few secret moment to have the kids color the Mommy pages and fill in the blanks to personalize them. The older one can help the 5 yr. old put the coupon books together and they are good to go. Thanks so much!!!! Thanks Nanna for your kind words! Made my day that you found my things useful! Nanna, you made my day! So happy the coloring pages helped you out! Yes Kim, Here is the Father's Day Coloring Page. 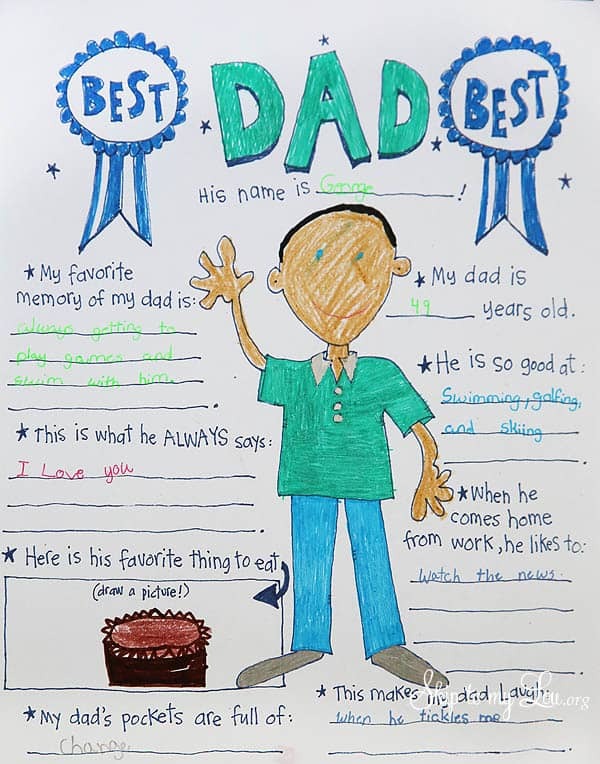 Yes, check the last line of the post and you will find a link to the Father's Day Coloring Pages. Let me know if you don't see it. Thank you! Great project for my students. Thank you so much . I was looking for some nice things my small friends could make for their mommy. This filled the bill ! Again, Thank You ! Hi! These are super cute! I was wondering if you could make a 'best kohkom' page so I can use it in my classroom. Either way, thank you for sharing. Thank you for these colouring pages - they're lovely! These are amazing. I'm looking for these for fathers day. If you make some I'd love to know. Yes I have them for Dads too. Click here Father's Day Coloring Pages for two cute designs. Hey your mother day page is great and u did unique and stylish color thanks for sharing with us. Love this! Would love a grandma one, too! So adorable! Is there one for Dad's and grandpas? Planning ahead for Father's Day! Great Ideas to make a grandma one! I will work on getting one made! @Paola, I am 34 years old, and I am going to do same thing !!!! These are great. Thank you for sharing. A Best Grandma version would be awesome too! I LOVE this. I just sent a link to my husband. Thanks!